Last weekend, our city hosted a marathon, we didn’t run, because we all know how I feel about that. Instead, we had a food marathon! Friday night we made dumplings with some Taiwanese friends, and Saturday we made Hamburgers with some American friends. I have to say, it was so much better than an actual marathon. We had the vacuum handy. Proof that Nick does the dishes occasionally. Hamburgers are Nick’s favorite American foods, and unfortunately where live in Taiwan, a good burger is hard to come buy. The best our city has to offer is McDonalds, and if you ask Nick, that is a sad excuse for a hamburger. In order for Nick to get his burger fix, we made hamburgers ourselves! We invited some of the other American teachers in our city, and they were just as happy as we were to have a taste of home. Unfortunately, I was too busy making and eating burgers to take any pictures, but just take my word for it, they looked and tasted delicious! I know it’s been a while since I’ve posted. I’m sorry, I know your lives all revolve around my blog posts. 😛 The writing bug hasn’t really hit me lately, but today, I’m breaking my radio silence! (Insert applause here). I just want to start with how amazing Fall is! Unfortunately, we can’t watch the leaves change color here in Penghu due to the fact that we only have plam trees and evergreens, but we can delight in the change in weather. I love Fall! The weather, the clothes, the upcoming holidays, the soups, the PUMPKIN, the opportunity to wear jeans to work and not sweat to death, everything! I’m using a lot of exclamation points here, but Fall is totally worth it! To kick off Fall, I made pumpkin pie!!! This was my first time making pumpkin pie, and I have to say it was a success! Not like it’s that hard, but you’ve gotta enjoy the little things. I made three, which I thought was a little excessive, but then everyone wanted to try some, so it went pretty fast saving Nick and I from pumpkin coma (it’s a real thing). 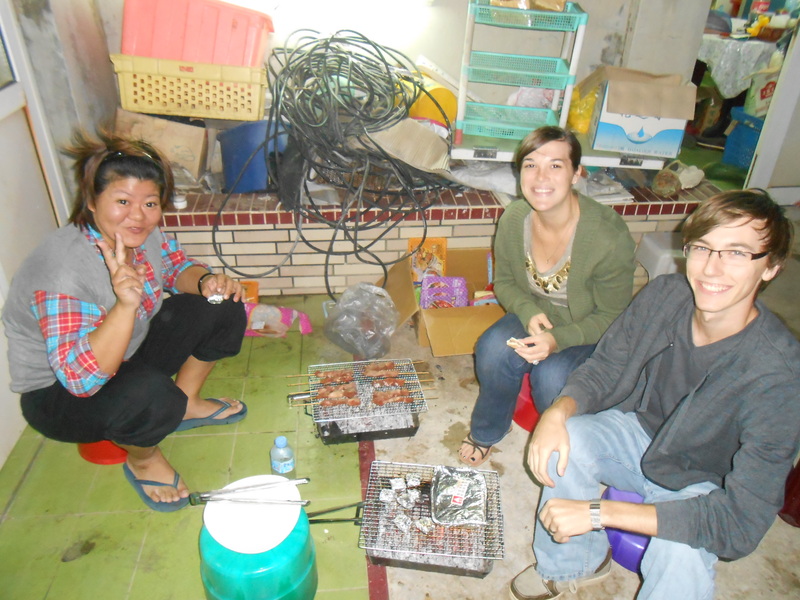 We followed up by making Flautas for a bunch of the foreigners in Penghu. Everyone loved them! That’s another great thing about Fall, we can cook and not sweat to death (as you can see, summers here are pretty brutal without air conditioning). Fall has already brought about many adventures in cooking, and as you know, we LOVE adventures! Another recent adventure of ours is dog sitting two dogs for a friend for a month. We love having dogs! 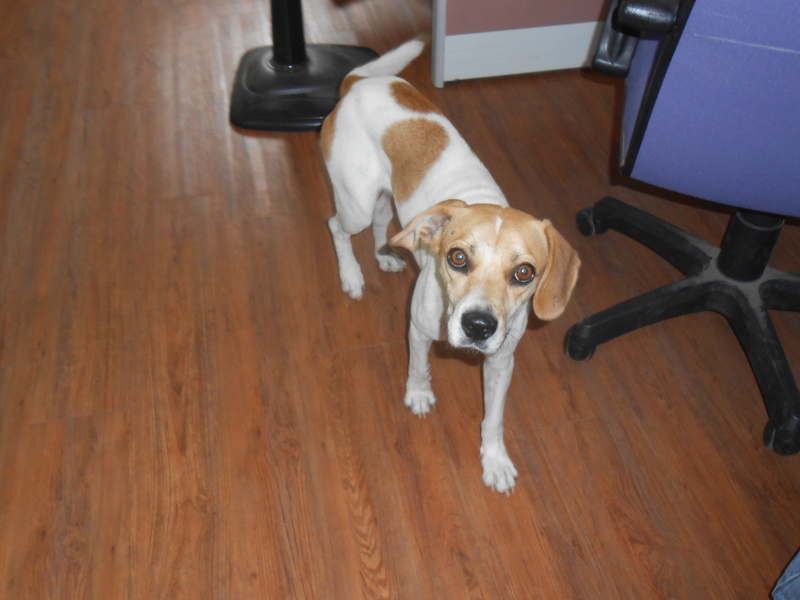 Nick was a little skeptical at first, but the dogs worked their magic and now he LOVES them! They add so much fun and excitement to our lives! The say people with animals are happier, and while I haven’t done any kind of studies, I agree with them. It’s a constant source of entertainment! 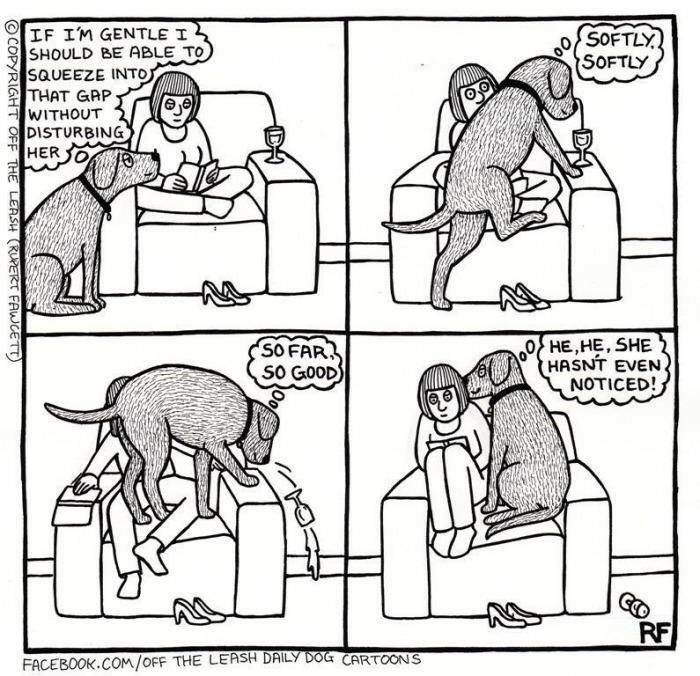 Dogs are just so funny! Hot Air Balloons. Who doesn’t love them? Only weirdos I’m sure. It’s on my bucket list to take a hot air balloon ride, and I thought my chance had come while we were in Hualien, but unfortunately, our butterfly hike took too long and we were late for the line. Shucks! But, I’m looking on the bright side. I’m only 23 and have my whole life to take that magical hot air balloon ride! Although my dream of riding on a hot air balloon did not come to fruition, we did sit and watch the balloons go up and down for about an hour. Is there anything better in life? While watching the hot air balloons, we learned something very life changing. 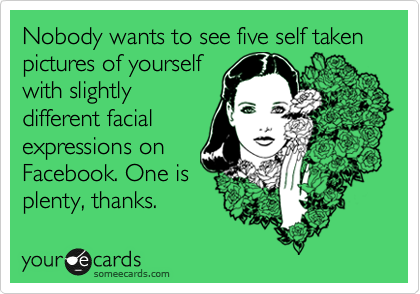 Wait for itttt….Girls like to take pictures of themselves. (SURPRISE!) There were some girls who, instead of enjoying the magic that is the hot air balloon, spent the WHOLE TIME trying to take selfies or making their poor boyfriends take millions (I’m not exaggerating here) of pictures of them jumping up in front of the hot air balloons. It was ridiculous! I contemplated throwing my french fries at them, but I didn’t want to waste the deliciousness of the fried food I was stuffing into my mouth. Okay, enough with that rant. Despite the picture girls, seeing the hot air balloons was wonderful (so were the french fries)! Our one and only selfie with the hot air balloons. After we had seen enough of the hot air balloons, we made our way to an aboriginal restaurant for their famous fish soup. There are still many aboriginal tribes in Taiwan. The aboriginal people are the first people who were in Taiwan, sort of like the Native Americans (minus the Trail of Tears). They try very hard to keep their culture alive by living in more traditional ways and sometimes will put on shows for tourists, or in this case, open a restaurant. To make the soup, they will first heat some rocks up to 1,000 degrees Celsius (that’s REALLY hot), and then make a bowl out of some leaves and put in the fish, some broth and vegetables. When the soup is ready to cook, they will take the rocks out of the fire and put them in the soup. The soup cooks very quickly because of the temperatures of the rocks. I have to say I was a little nervous when I was first trying this soup (I mean, rocks, really? ), but it turned out to be really yummy! Nick even liked it and he doesn’t really like fish! Today our topic is Bar-b-que. Bar-b-que is a well known word in Texas which inspires visions of massive smokers, grills, tubs of potato salad, sweet tea, baked beans, and a sunny Texas afternoon. Nick and I love bbq! When we came to Taiwan, we thought we’d have to say goodbye to bbq for a year, but we were surprised to find that bbq is a popular thing here although it is done on a much smaller scale. Massive smokers are replaced with tiny grills, brisket and baby back ribs are replaced with chicken, fish, squid, and other Taiwanese favorites, like sweet potatoes. But the thing that the two have in common are friends and fun! A few weeks ago, we were invited to a BBQ at Anly’s grandparents’ house; they live right on the water, so we had some fantastic views and some great friends to BBQ with. Anly’s uncle fishes for oysters (I’m not sure fishes is the right term, but you know what I’m saying), so we had some delicious oysters, sweet potatoes, chicken, sausage, and fish. The whole night was full of fun, laughter, and good food! Yummy Oysters. I never thought I would be saying that. We’ve got a couple of pros here. Hugo is our new best friend! A couple weeks ago, we had a four-day weekend and we celebrated with some cooking adventures, and trust me, cooking is almost ALWAYS an adventure in our house. We have decided that our cooking motto is “However long it is supposed to take, double that, times it by five and subtract three, and that is how long it will actually take us.” (Yes, it is a bit long for a motto, we’re working on making it short and sweet then slapping that baby on a t-shirt.) 😛 Okay, so maybe it doesn’t take that long, but it always always takes us much longer than we anticipate at the get go. I guess we just haven’t gotten cooking/baking down to a science yet. I always feel like I’m running around like a chicken with my head cut off trying to get everything put together correctly. After sitting around and being lazy for the rest of the weekend, Sunday night we decided to make some muffins and egg salad. 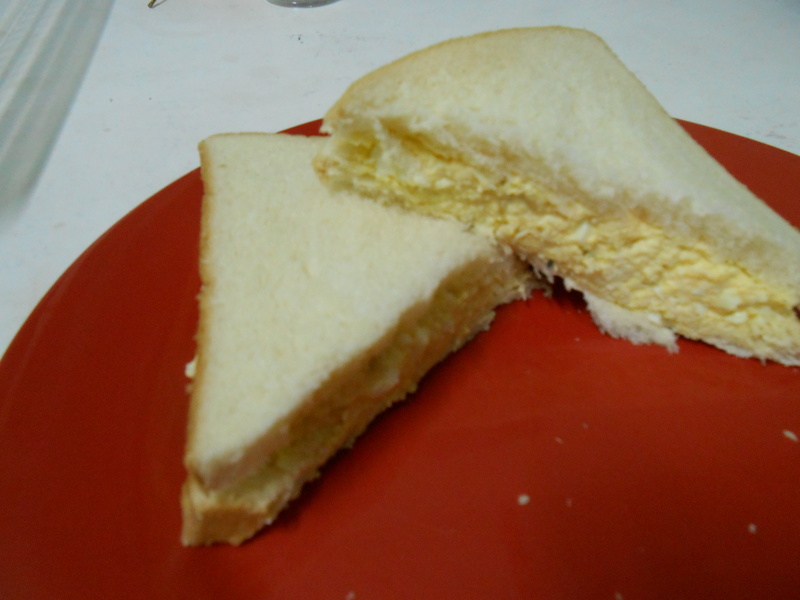 We’ve been craving egg salad ever since the Eggtastrophe. Our biggest problem was not having mustard to make it (we checked every store in town, and all we found were packets for the hot dogs at 7-11), but our fellow FET was making a trip to Taipei and told us she could pick some up for us! So, mustard in hand, we enlisted our friend Anly for some help, and we began making our egg salad and muffins (don’t worry, these were new eggs). While the eggs were boiling, Anly and I started making some yummy French Toast Muffins for breakfast in the morning. All was going well until Nick took over washing the dished for Anly. He always uses the excuse that his hands are too big to fit in the glasses in order to get out of doing the dishes, and was making that exact comment, when all of a sudden he yells out, “Ouch! That’s deep!” I rush over and see that his hand had broken one of the glasses and had stabbed him. The cut was deep and seemed like it would not stop bleeding. We cleaned the wound, and were about to leave for the ER for some stitches when the bleeding stopped. We bandaged it up the best we could (which wasn’t very well considering we have 4 band-aids at our house), and Nick sat down to rest while Anly and I finished up the dishes. Nick is fine now, he saw the school nurse and she cleaned and bandaged the cut thoroughly and it’s healing nicely. I’ve made it clear to him that this does not get him out of dishes for the rest of his days, he’ll just have to leave the cups to me. Also, we are proud to say that despite the incident, the egg salad and muffins both came out wonderfully! 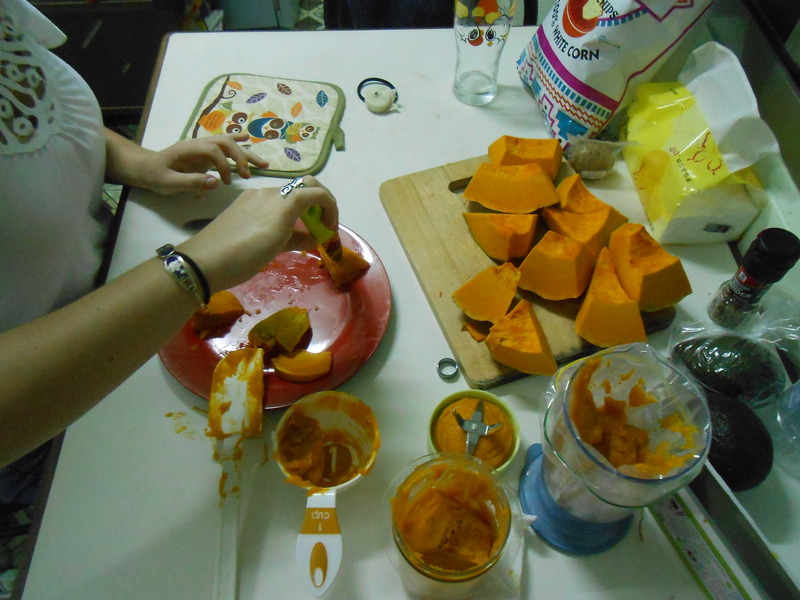 The finished product- 8 cups of pumpkin puree! It’s always fun to have a friend around. We know we’re not a foodie blog, but the stuffed peppers we made last week were epic, and they had an epic (at least for food) end as well, so we decided they were blog worthy. Just sit back, relax, grab some popcorn, and enjoy the show! Now, if you’re new here or have memory problems, we live in Taiwan. Penghu, Taiwan to be exact. In Taiwan, specifically Penghu, Tex-Mex is hard to come by, and if we want it, we pretty much have to make it ourselves. We’ve been craving Tex-Mex lately, so after scouring the internet, we decided to try our hand at Tex-Mex Stuffed Peppers. After many busy days and nights, we had a quiet Thursday night in which to make and enjoy our stuffed peppers. All day long we were looking forward to these tantalizing treats, and couldn’t wait to get home to start on them. But when we got home, we were both exhausted (an ill-planned late-night cup of coffee left us wide awake most of Wednesday night), and decided to take a quick nap. Given our track record with “quick naps” we should have known; this nap would not be a short as we hoped. We woke up around 7:00 and hummed and hawed about whether we should go ahead and make the peppers or get something out. We eventually decided we would make the peppers, and I am glad we did. These peppers were delicious! They totally satisfied our Tex-Mex craving and left us raving. We normally don’t get this excited about food, but we couldn’t stop saying how delicious these puppies were. I’m drooling just thinking about them. Anyways, we were watching Psych (a great show, btw) while eating our delectable peppers, and all of a sudden we hear a CRASH! We whip our heads around and see the second pan of peppers dumped all over the floor and the dog running for cover from the wrath he knows he’s about to receive. I almost cried over the loss of the peppers; there was no way to save them, so I just had to trash the whole thing. 😦 Nick pulled the dog out of his hiding place (under the table), and made him sit in time out. After several minutes of time out, Nick knelt next to the dog and calmly talked to him about what he did wrong and that it made “mommy” really upset. He knows this doesn’t have any affect on the dog, but it made him feel better. 🙂 He’s gonna be a great dad! Our evening ended well with some family time on the couch and no bitter feelings, just longings for left over stuffed peppers. 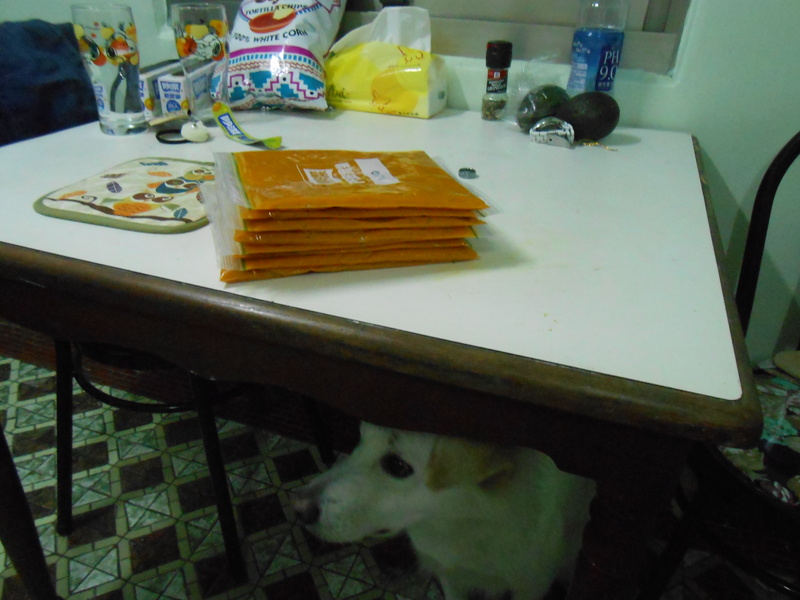 Moral of the Story: Put the left over food in the highest place possible when curious puppies are sniffing around. Wednesday was Taiwan National Day or Double Ten Day. It commemorates the uprising that led to the establishment of The Republic of China, more commonly known as Taiwan. 🙂 Because of this day, we had a holiday from school. Our friend and co-worker Anly, invited us over to her house for lunch! Anly has been very helpful and really friendly to us. She has showed us where many places are around town, and always answers any questions we have about anything. Needless to say, we were very excited to be invited over to her house. 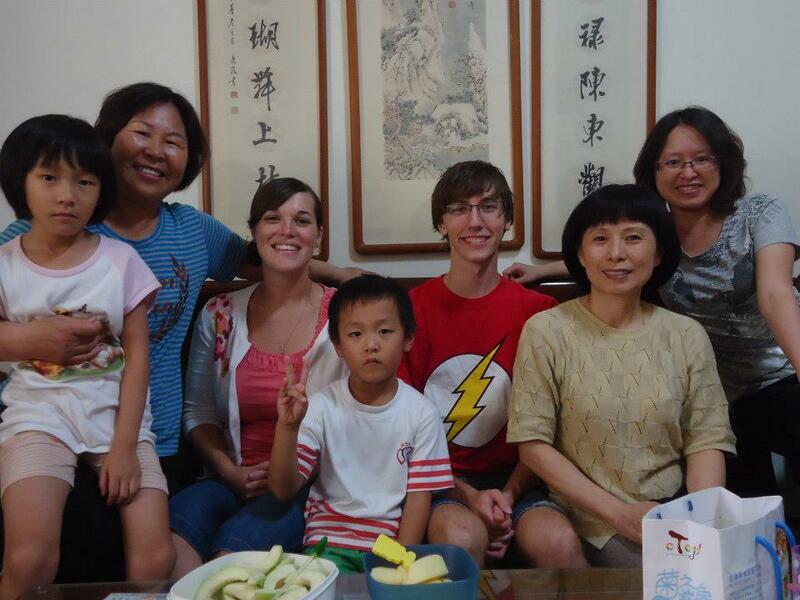 When we arrived at her house, we met her mom, aunt, sister, and her niece and nephew. Then we sat down to a tasty looking lunch. The main dish was fried rice balls. They were delicious. They are made with rice (obviously), mixed with some bits of honey ham, and cilantro. Once that is mixed, you roll it into a ball and put some cheese in the middle. Next you roll it in bread crumbs and fry it. So unhealthy for you, but really really tasty. They also served some chicken soup, seaweed (surprisingly tasty), white carrots, and pork. It was all so good, Nick and I were stuffed by the time lunch was finished. After everyone was finished eating, we sat and chatted for a little bit. Anly’s mom and aunt asked us a little about our lives and where we come from. It was wonderful getting to talk with them! The kids- Melody, who is seven, and Hugo, who is five were playing in the living room, and eventually, Hugo put on a home made Patrick (Spongebob’s best friend) mask and started waving a sword. I then proceeded to put on a Spongebob mask and challenged him to a duel. He accepted and we both fought valiantly, but being the kind person I am, I let him win. After that, we started playing with trucks on the floor and he was serving us make believe ice cream and drinks. He was quite the little host. 🙂 It was so much fun! It’s surprising how much you can communicate even when you don’t share a language. 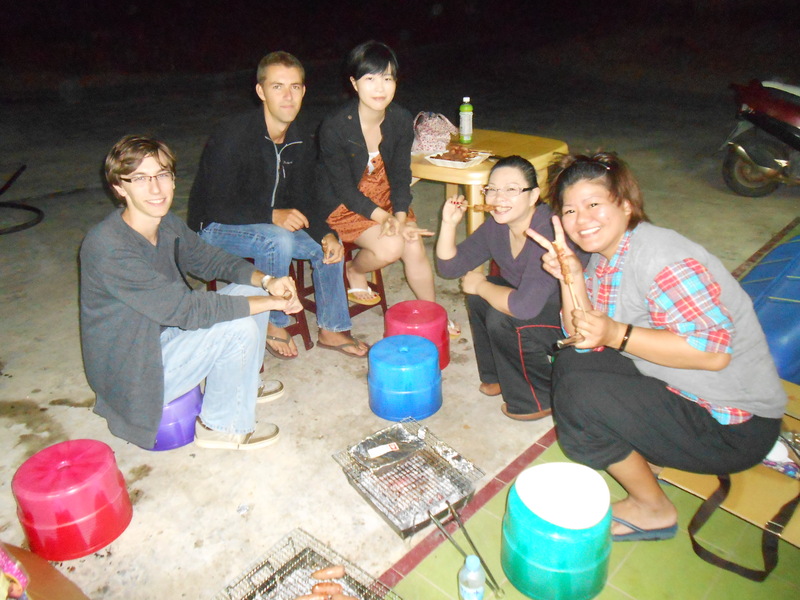 We have never felt lonely here, which is wonderful!!! Everyone is so kind to us and makes us feel included. So, this past weekend was a blast! We started Friday with no plans for the weekend, other than a movie date with our co-worker Anly. We were just going to take it easy and chillax, because that’s nice every now and again. But, a simple weekend of going to the market on Saturday morning quickly turned into the busiest weekend we have had since living in Penghu. We woke up and decided to go to the market and grocery store. We got a late start, so we were hurrying to get to the market before all the vendors closed up. We barely made it, but thankfully there was still some chicken left. 🙂 After that, we ran to the grocery store to pick up a few staples for the kitchen. While perusing the aisles of the store, we ran into Ted. Ted is a fellow English teacher and the proud owner of The Beach Break, a surf shop here in Penghu. He told us he was a little overwhelmed because a group of about 40 Europeans asked him if they could have dinner at his shop that same night. The weekly dinners are a tradition during the summer, but Ted and his wife had all but closed up shop for the impending winter, and he wasn’t expecting a group of 40! He invited us to stop by, and then had to run in order to prepare everything for that evening. Nick and I were excited to go and meet all these English speaking people, so we went home, took a nap, and made some food to take to the dinner. The dinner was a huge success! 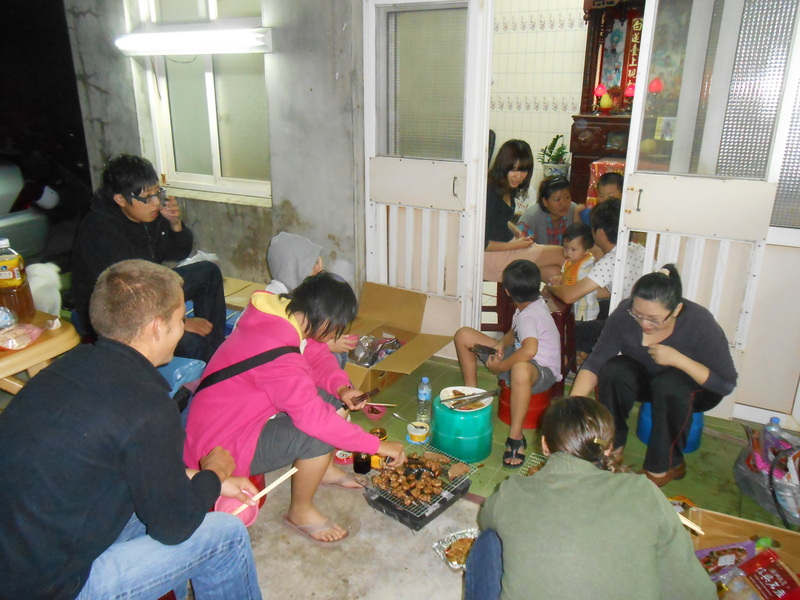 All of the Europeans showed up and loved the food and getting to hang out in Penghu. We found out that they were all exchange students at the University in Taipei and hit up Penghu for a long weekend of fun. There were students from Germany, France, Spain, Sweden and the Netherlands! It was fun getting to talk to people of all different cultures, and getting to hear their unique accents. 🙂 I am always excited to hear accents from other countries, I guess you could just call me weird. 😉 We were even more excited to spend an evening around English speakers. You don’t realize how much you miss being able to understand all the people around you, until you are able to experience it again. We went home around 12:30 am in the hopes of being able to stay awake through church the next morning. I was able to stay awake through the service, but it was a constant battle with my eye lids. It made me realize how old I’m getting 😛 We stayed for small groups after church, and the other young adults in our group invited us to have lunch with them after church. 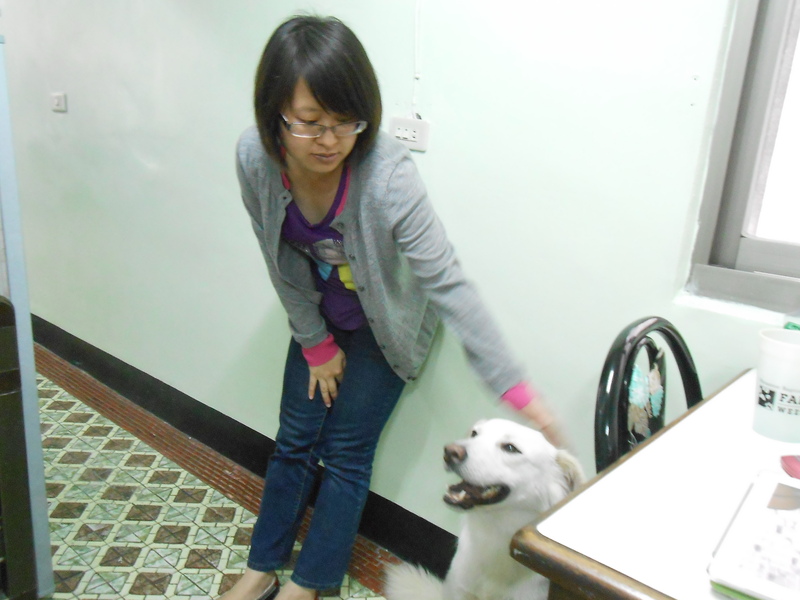 I was very excited, because this was the first time we were invited to go out with them. It’s a great feeling when you feel like you are officially involved in something. We went to this small restaurant close to the church that served noodle soup (I’m not sure if that’s the official name, but that’s what we’ll call it). I had noodles with pork, and Nick had the “extra spicy” noodle soup that featured Pig’s blood 🙂 While eating, they asked us questions about where we are from, how we are enjoying Penghu, and English grammar. Surprisingly, grammar questions are frequent occurrences in our daily conversations, so it’s a good thing Nick was an English major. 🙂 Towards the end of the meal, they invited us to go to a BBQ at one of their houses later that night. We eagerly said yes, and voila! Another day filled with excitement. I’m sure all you Texans are wondering what a Taiwanese BBQ was like, and I’ll ease your worries now, it’s nothing compared to Texas BBQ. We arrived at the house to find our friend sitting on her front porch with this tiny grill that was about 1 square foot, and stood about 2 inches off the ground. 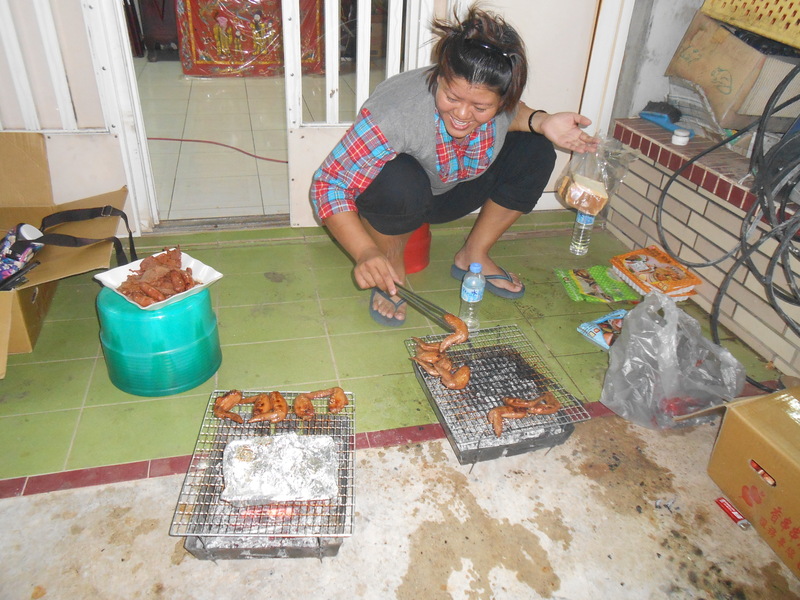 We were eagerly invited to pull up a tiny stool (to accompany the tiny grill) and start BBQ-ing. I have to brag that I am now an expert at grilling pork skewers 😉 They had tons of meat- pork, chicken, fish, tofu (which isn’t meat, but I’m including it), dried squid, and something we assume to be chicken livers (we didn’t try them). It was all really tasty, and the company was wonderful, but we did get a little cramped sitting on the tiny stools. One of the girls had recently visited Australia, so she contributed some Vegemite which Nick and I decided wasn’t our favorite snack. We thoroughly enjoyed ourselves and had so much to eat, but we had to rush off to catch Taken 2 with Anly at the local movie theater. We love the popcorn they serve at the movies. It’s kettle corn, and coincidentally, kettle corn has a special place in each of our hearts, right next to chocolate for me and tools for Nick. 🙂 We enjoyed the movie, Anly’s company, and of course the popcorn, and returned home exhausted, yet satisfied. We woke up and wondered where our weekend went! When we arrived at school we had a new friend follow us in. 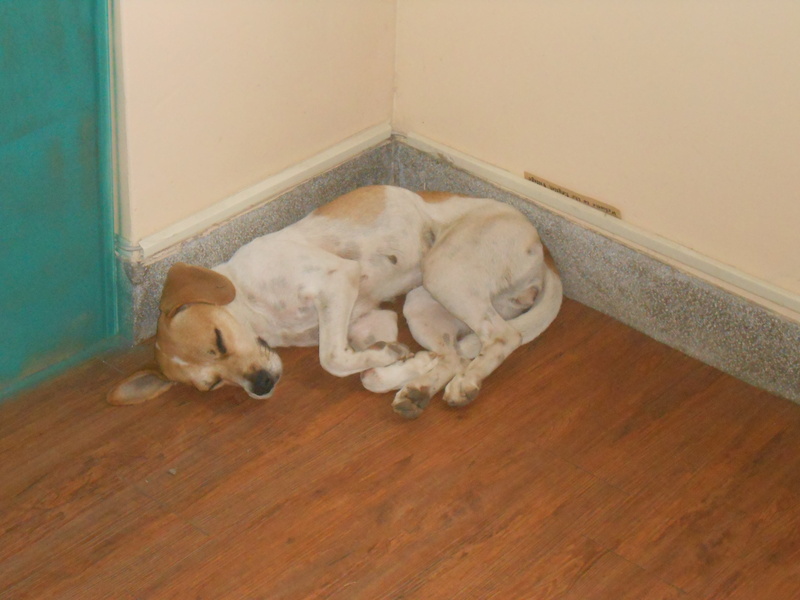 She was so cute and curled up in the corner despite our multiple, albeit half-hearted, attempts to get her to leave. Unfortunately, some other people tried harder and eventually sent her away. 😦 But in her defense she put up a good, yet polite fight! I looked out the window for her all day, but I could never see her.